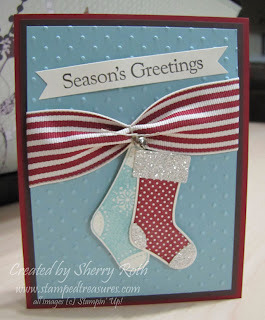 I am really enjoying the Stitched Stockings stamp set. I must admit that it wasn't on my first Holiday Mini order though. I saw the punch and thought I could get away with creating great things with the punch alone, but to be honest - now that I have the stamp set, I'm so happy I got it. I LOVE it! This card was one of the projects my club members did this month. The photo doesn't do it justice, the bling from the silver glimmer paper is amazing! My inspiration for this card came from a Halloween card that was pictured in the Stampin' Success magazine that we, as demonstrators, receive each month. I love using it as a source of inspiration. It's always full of beautiful projects created by Stampin' Up! staff and talented demonstrators. Let me know if you'd like more information on how you can get these monthly magazines. Order your Stampin' Up! products online 24/7!